A stunning slice of agate takes center stage in this lustrous necklace. 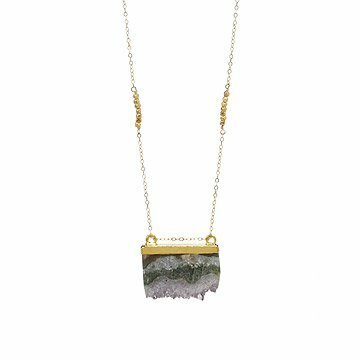 Lucy Dalton's necklace features a stunning slice of pale violet and green agate, crowned in brilliant gold and suspended from a fine gold chain accented with faceted gold nuggets. The bottom edge of the slice showcases a fan of natural crystals, a beacon for the stone's protective qualities. Dalton suspends the pendant from two points, in a composition that suggests balance as well as unpretentious beauty. Handmade in Brooklyn, NY. Click here to see the Golden Agate Slice Mini Earrings. Never did Lucy Dalton think that at the age of 13 that her first jobs, running diamonds for her Father to be set on 47th Street in Manhattan or assisting her Mother with quality control inspections of rubies, sapphires and emeralds because she could not get a babysitter that day, would have been the best education she would ever receive. But it was. After opening her first retail women’s store in 2004, Lucy naturally gravitated towards the jewelry side of the operations. She soon started to design and create her own jewelry and spent much of her free time making custom orders for individuals, bridal parties and as special gifts based on designs tailored to each customer’s needs. After opening her seventh retail store and having produced her custom jewelry collection, Lucy decided to expand the operations to include wholesale distribution in 2012. Much of the pieces in this collection are tried and true, having been worn, loved and re-ordered by customers that she have worked with for almost a decade. They are pieces that are hand-made entirely with high-quality metals and natural stones, each of which she has hand-picked with care. Due to the natural formation of agate stone some variance is to be expected. This lovely necklace was gifted to me and I'm so happy to have it join my jewelry collection! It's the perfect size and weight. Despite the unique style, it surprisingly goes with a lot of my outfits -casual or evening looks. I love staring at it from time to time and rubbing my finger lightly on the edge of the jagged stone. Also, I've received plenty of compliments from friends and strangers!! I love the look and quality of this necklace and can wear it with nearly anything. The beads on the chain are a charming detail.